To create a balanced, motivating, engaging and genuine understanding of Islam in both Muslim and non-Muslim communities and to provide real scholarship that realises the quality and the reality. 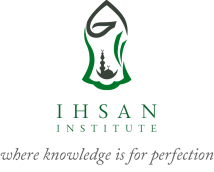 Ihsan takes its name from the Arabic word Ihsan which means perfection, beauty and sincerity. In the hadith of Jibril, Ihsan​ is defined as: To worship God as if you see Him for if you see Him not, He definitely sees you. Ihsan is therefore the status of perfection of faith and displaying its beauty; Ihsan carries the message of doing things with perfection and intention. It carries the meaning of finding a purpose for life and working seriously for this purpose. Since Almighty Allah has commanded us to be with the ‘muhsineen’ (those who attempt to be perfect in all their deeds), we are supposed to make Ihsan​ the logo and motto of our life. Providing traditional Islamic knowledge to non-specialists who want to get proper Islamic knowledge or what is known as ‘individual duty’ knowledge to protect themselves and their souls from self-acclaimed scholars and self-appointed muftis and unqualified speakers. This route is not aimed to make the attendees scholars, but to have proper knowledge to run their day to day life in compliance with the Islamic aim of perfection in everything. Providing Islamic scholarship to serious knowledge seekers who want to specialise in Islamic studies and learn traditional knowledge in the same way it is taught in the world famed Al-Azhar institutes and university and the same way Islamic knowledge has been taught through centuries in the centres for learning in the Muslim world. However, Ihsan observes the context in which these students live and aims at qualifying them to draw the balance between text and context. Training Imams and Religious teachers who take the leadership within the British Muslim community in order to raise the level of qualification and provide qualified religious leadership within the Muslim community that understands its reality as much as it understands its faith. It also aims at acquainting Imams coming from abroad with the new reality they are living in and revive in them the core messages of Islam; moderation and balance. Qualifying Qur’an teachers and students interested to study Qur’an at a more academic and traditional level by providing a space for memorisation, learning Tajwid and Qira’aat. Providing short term courses on important topics that interest Muslims in the West in general; along with long term courses for students who look for a more maintained and deeper understanding. Providing consultancy on Muslim issues and introducing the genuine message of the Islamic faith and putting individuals and organisations in touch with the real scholarly organisations in an attempt to slam the door in face of misrepresentation and stereotyping. Inspiring young people to be proud and learn before speaking and save them from falling into the hands of extremists.